Over the past year, I have been working with my colleague John Van Walleghem, to set up a two-day event on inclusive education in Manitoba. To be held in conjunction with the 7th International Conference on Social Role Valorization Conference we asked for nominations of schools where there has been a sustained and sincere effort to ensure that all students in the school receive a valid and valued education. John and I had the privilege of visiting several schools, getting a tour and having discussions with both administrators and teachers. These educators spoke thoughtfully about the work of moving toward a more inclusive school community, where teachers are both challenged and supported in their practice and students thrive physically, socially and academically. In this brief article, I will highlight some of the observations that these educators shared with us. In all cases, we heard that administrators paid attention to and respected the educators they worked with. They trusted them and made sure that they had what they needed to be successful in an inclusive school. This included offering training for teachers and supporting the development of professional learning circles. Administrators also made other changes that qualify as effective inclusive practice. Most took responsibility for the placement of all students into classes. No longer could a teacher refuse to accept a particular student into her/his classroom. This meant that the composition of classrooms is thought out and balanced. Some administrators reduced the numbers of educational assistants within the school and hired more classroom and support teachers. In some cases, each grade level now had a support teacher as well as a few educational assistants. In some cases, when students move from one grade to the next, the resource team moves with them to the next grade, ensuring a helpful continuity for the students while in that school. IEPS are actually developed each spring, and that means a more focused and less frantic start to the school year in September. Of course, some students transfer into the school, but this is manageable if prior educational planning has taken place for other students. In some of the schools we visited, administrators have built in shared planning time for the classroom and support teachers. Moving past the odd preparation period, they developed schedules where teachers meet to discuss grade and subject level curriculum as well as plan for individual students who benefit from adaptations and other supports. Having a set schedule with predictable meeting times has also reduced a level of anxiety among educators within a school. They know that they will have the opportunity to discuss various issues and to receive needed supports from their colleagues. One of the outcomes of this planning time is the development of closer working relationships among the various people within a school. As trust grows, it is easier for classroom teachers to be open to co-teaching with a support teacher, or to have the support teacher teach their students while they prepare their own materials. The role of the educational assistant (EA) also changes. While some may still be assigned to individual students for particular tasks, most are now assigned to work with and support classroom teachers. Students are no longer ‘the’ work of the EA, but are seen as the responsibility of the teachers in the school. This is a crucial change in mind set for some, and it has opened up new opportunities for students. They typically stay in their assigned classrooms with their peers and various supports are made available to them in those classrooms. In the schools that have made these types of changes, all students are included in field trips and other special events. More students receive support to join and take part in extra-curricular activities that are available through the school. We also learned that division level expectations and support facilitated these school level changes. Divisional administrators still have to make sure that all schools receive the resources they need while at the same time staying within the budget. But the school based administrators appreciated having leadership and practical supports from the school division folks. We have many examples from across the province of individual students who have received a meaningful education while being fully included in their school community. Increasingly, we have examples of whole school and even school division commitment to full inclusion. We know that with a change in school or divisional leadership the day to day experiences of teachers and their students can change dramatically. Identifying the administrative supports and structures that facilitate inclusive education is one positive step in the move from idiosyncratic inclusion to a school system that educates all students well. 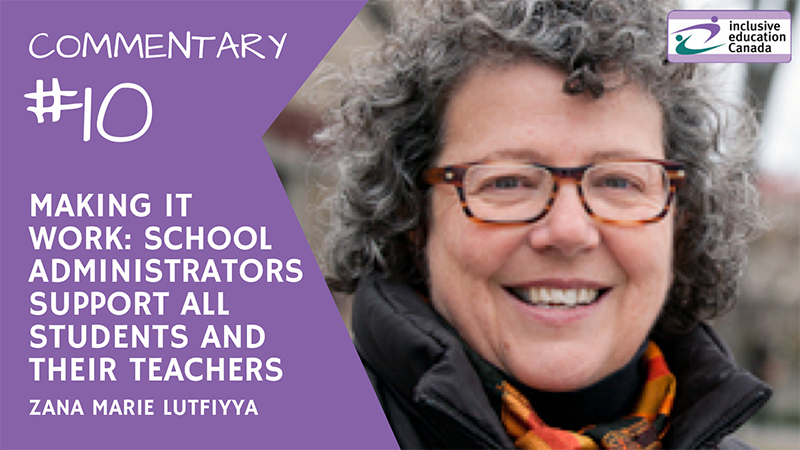 Zana Marie Lutfiyya, Ph.D. is a professor in the Educational Administration, Foundations & Psychology (EAF&P), Faculty of Education, University of Manitoba. Since 2015 She has been the Director, Peace and Conflict Studies Graduate Program. 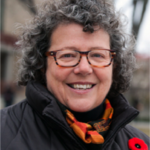 Her longstanding research interest has been identifying and examining the factors that help or hinder the valued social participation of individuals with intellectual disabilities in community life. This has included where individuals live, go to school, work and take part in recreational activities. Previous postL’inclusion scolaire : un droit et une affaire d’équipe !